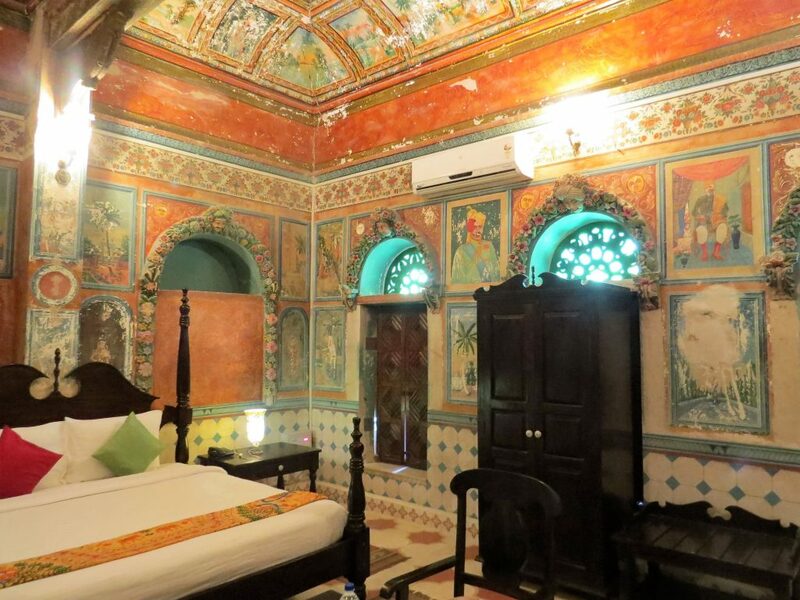 Malji ka Kamra, nestled in the quaint town of Churu, is a charming base from which to explore Rajasthan’s fresco-filled Shekhawati region. 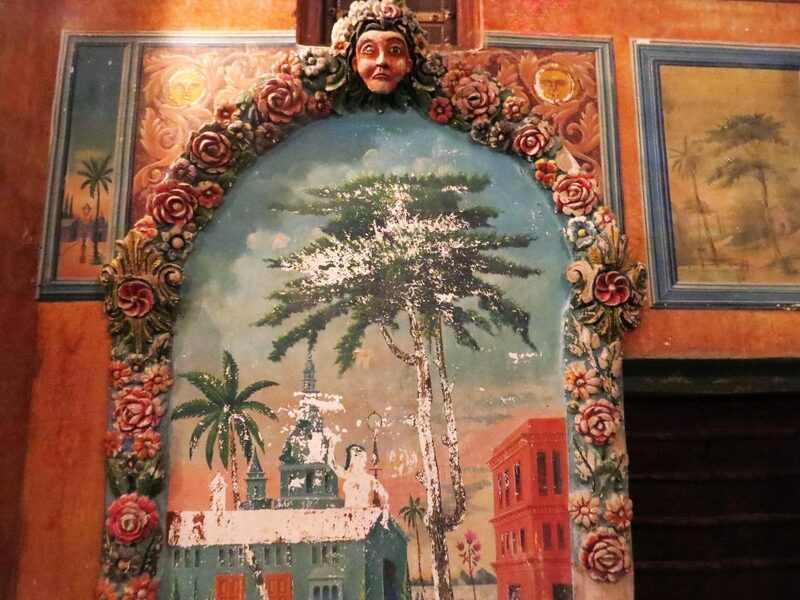 This unique building has been lovingly restored, ensuring a comfortable stay whilst retaining much of its original features; most notably a number of beautiful hand-painted murals adorning the walls. 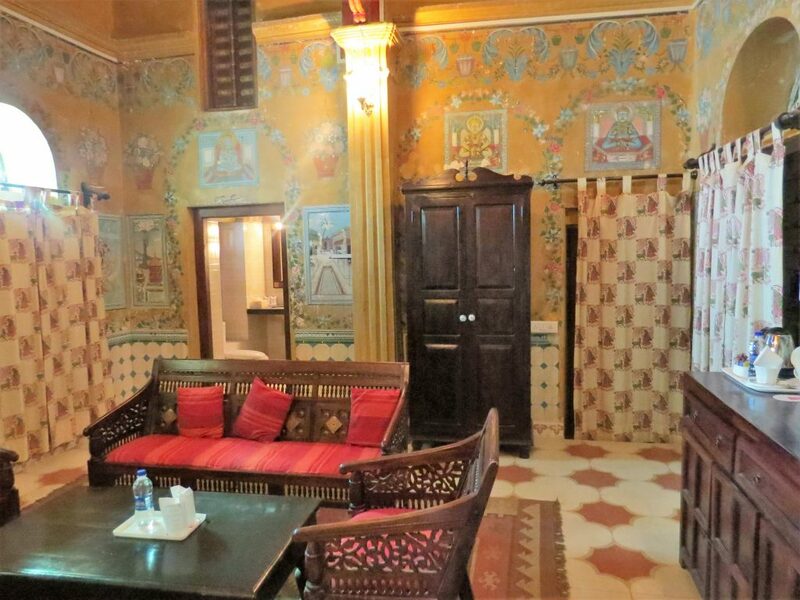 Like all the properties we’ve hand-picked for our guests, we recently stayed at Malji ka Kamra. Here, in photos, we share our experiences. 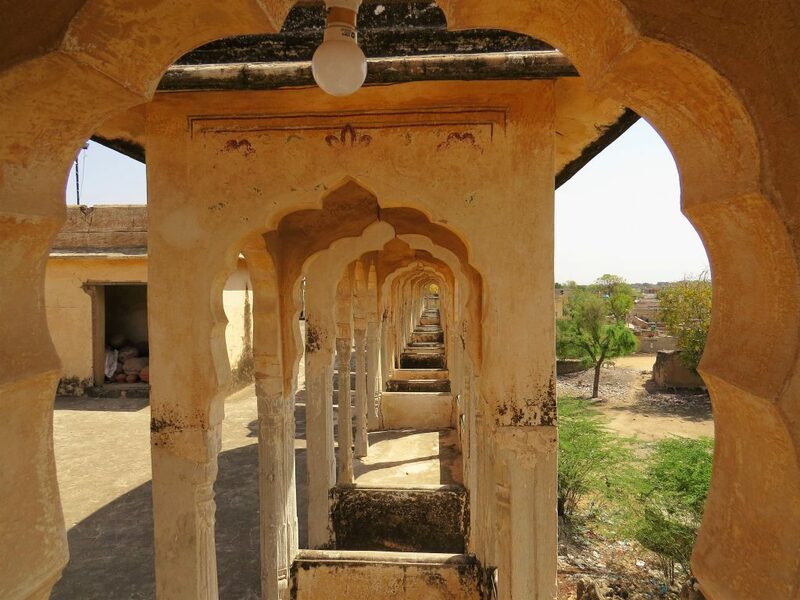 Firstly though, you may be wondering what the Shekhawati region is. 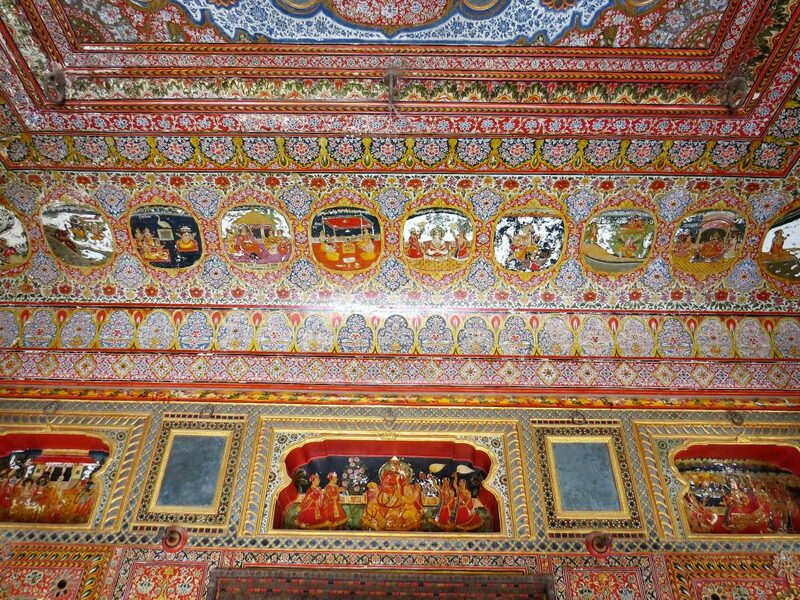 It refers to a cluster of small neighbouring towns in Rajasthan, each with beautiful well-preserved painted havelis, and all of whom prospered thanks to the region’s strategic location on the old camel caravan trade route. 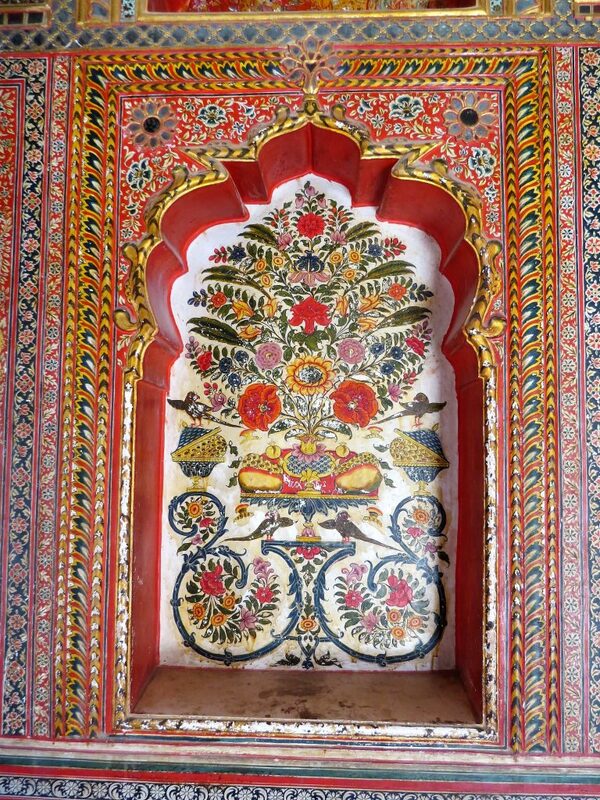 The havelis of Shekhawati are sprawling old houses built in the late 19th and early 20th centuries, decorated exuberantly with incredibly detailed murals and golf leaf work. 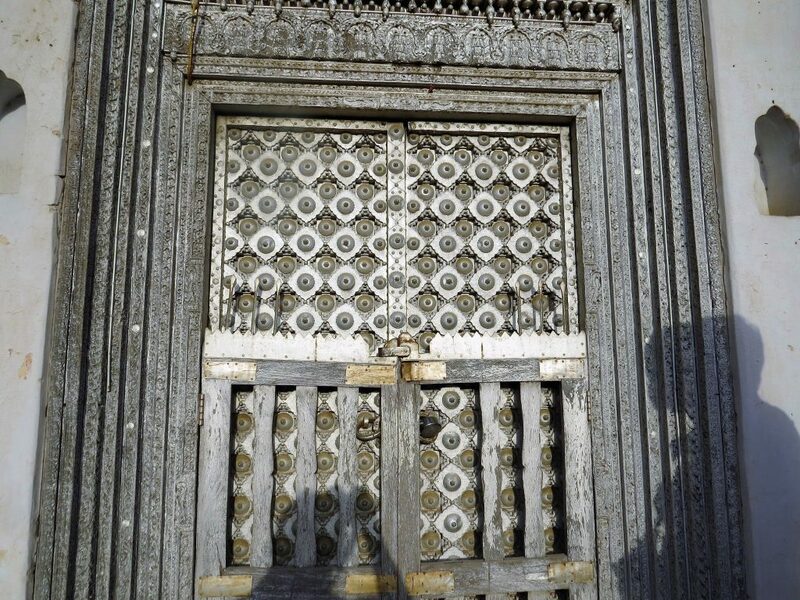 They were constructed by rich local merchants. 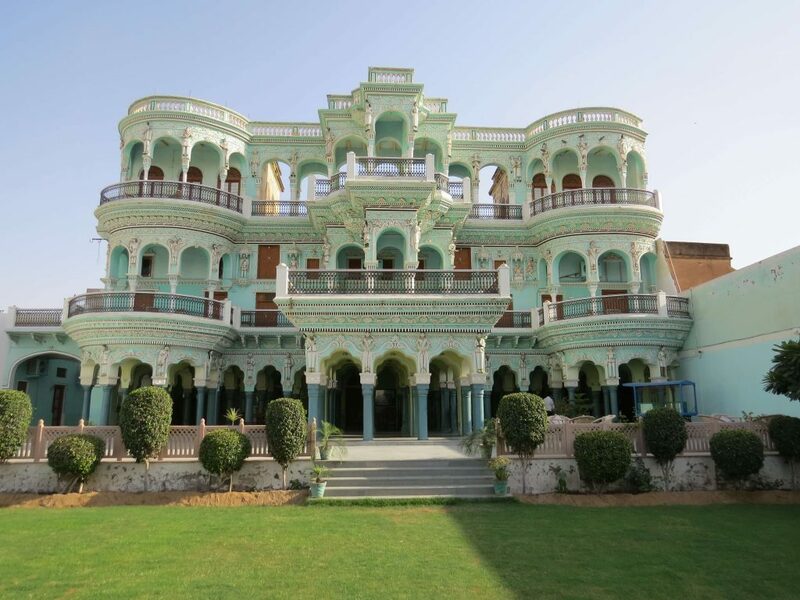 Churu has some stunning havelis of its own, though Malji ka Kamra is also ideally located for exploring the neighbouring Shekhawati towns of Mandawa, Mahansar, Fatehpur and Ramgarh. Reaching Churu after a long drive from Delhi, we passed through a narrow street. 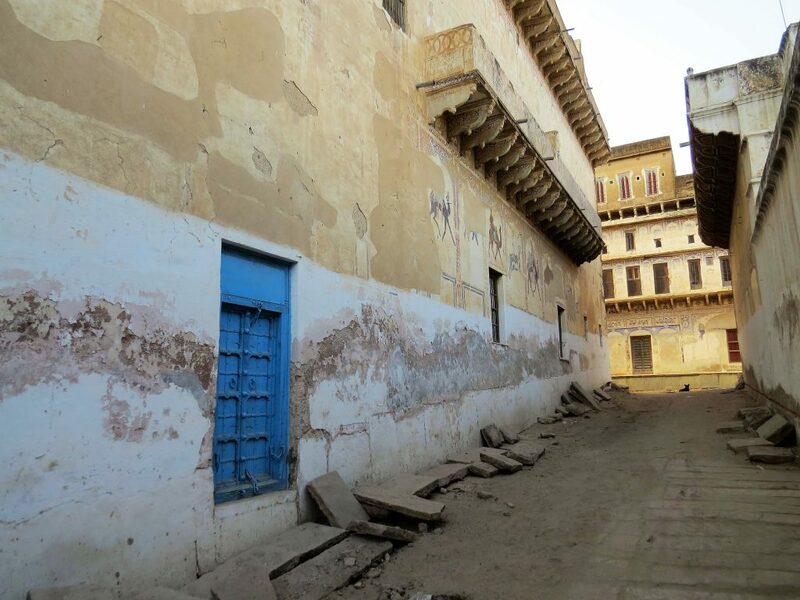 You’d never imagine that at the end of this street lies a magnificently restored, century-old haveli. From the outside, its tiered structure almost looks like a magnificent mint-green wedding cake. 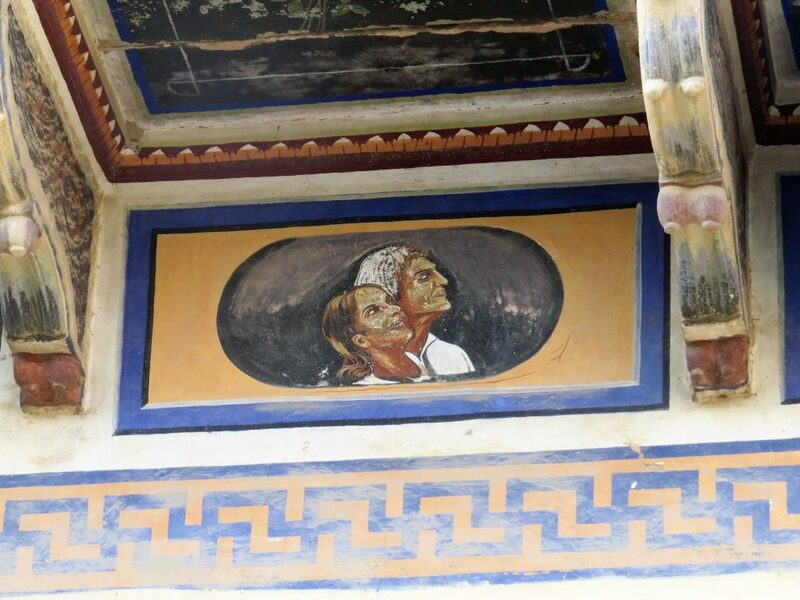 Inside proves just as unique: original hand-painted frescos adorn the walls, complemented by tasteful Indian décor. The building boasts a unique fusion of architectural styles, from European-inspired pillars and Italian Art-Deco, to traditional Mughal archways. 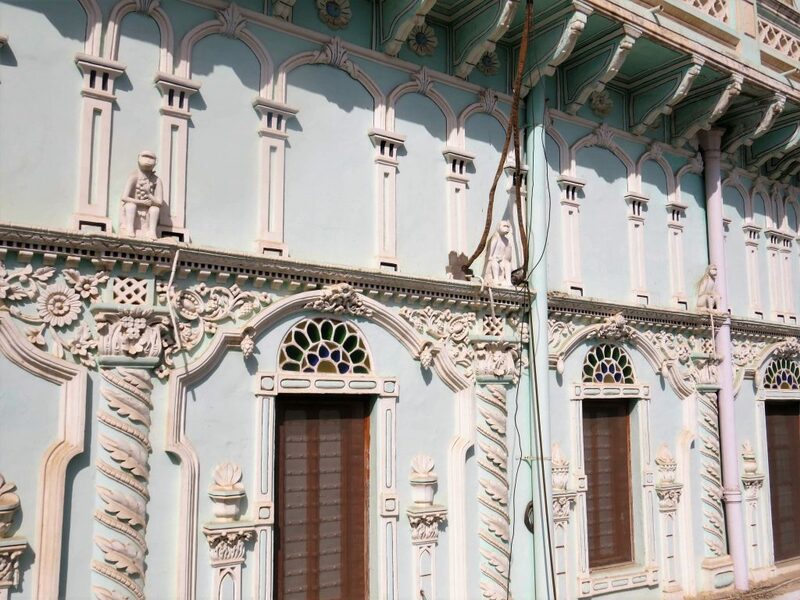 Malji ka Kamra dates back over a hundred years and was originally built by Malchand Kothari (a local rich merchant) as a guesthouse, serving as the venue for many of his parties. The Maharaja of Bikaner stayed on several occasions. 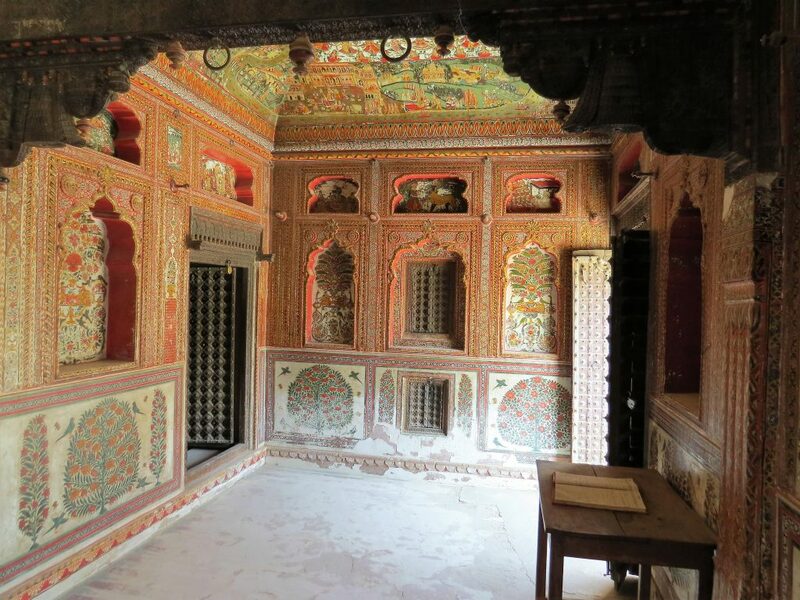 “Our 12 room property works as a unique gateway to discover Shekhawati’s “open art gallery” beyond its touristic town of Mandawa. 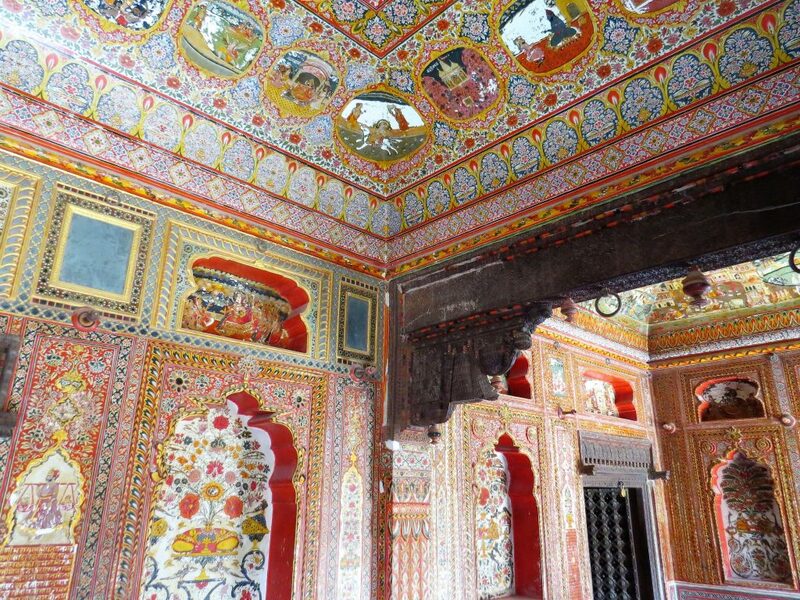 Churu’s havelis, quiet as they are, serve as a breath of fresh air and take you to a different era. 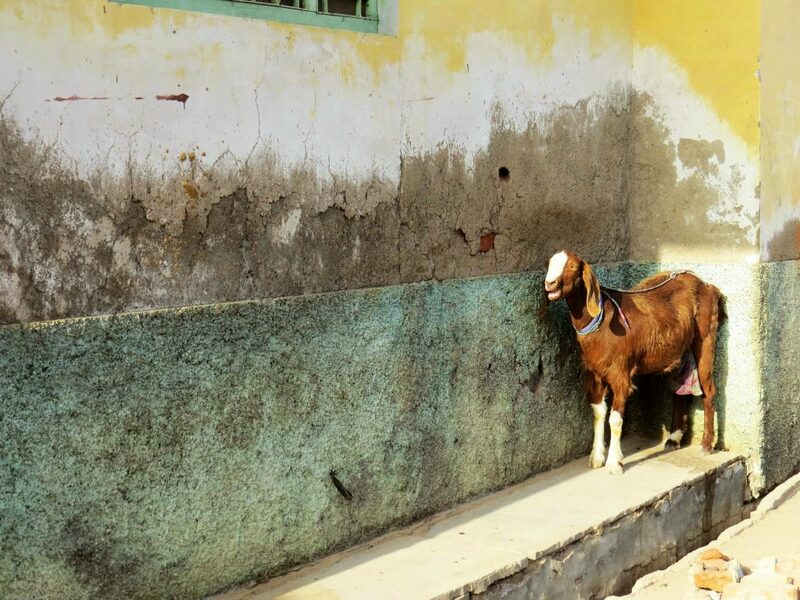 At the same time, there is much to discover in Churu – from heritage walks to farm visits, picnic breakfasts to romantic dinners; you can even visit the local school or explore the colourful vegetable market on foot”. During our craft tour, we visited a local textile artist. 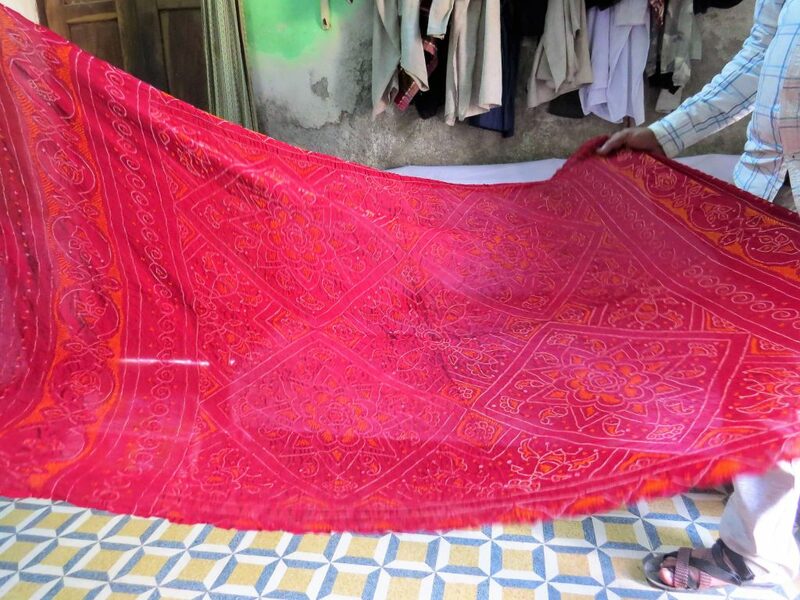 He and his family produce these delicate, colourful saris. Our next stop was at a traditional Indian bangle maker in the old bazaar. Watching him produce his colourful pieces was quite mesmerizing. Following the craft tour, we commenced our Heritage Walk. 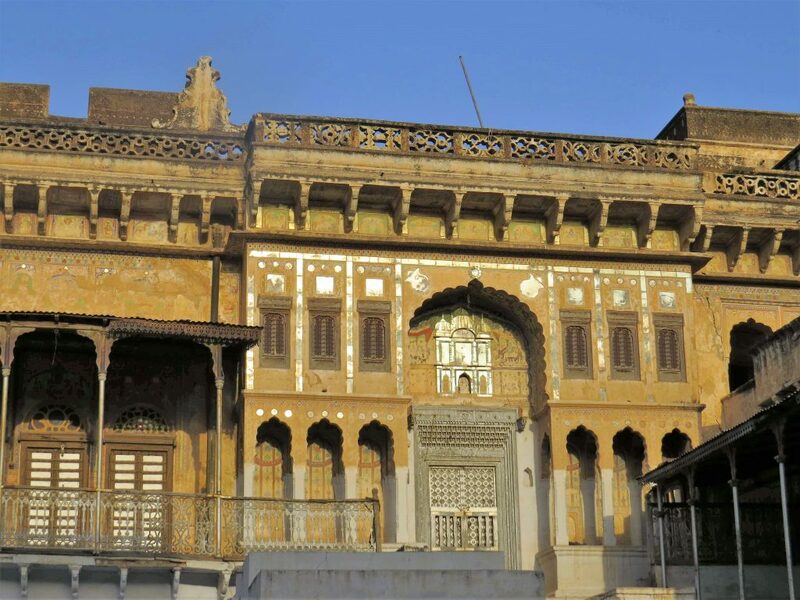 Accompanied by an experienced guide, the Heritage Walk invites you to explore Churu’s stunning havelis, a local Jain temple, and a small museum. 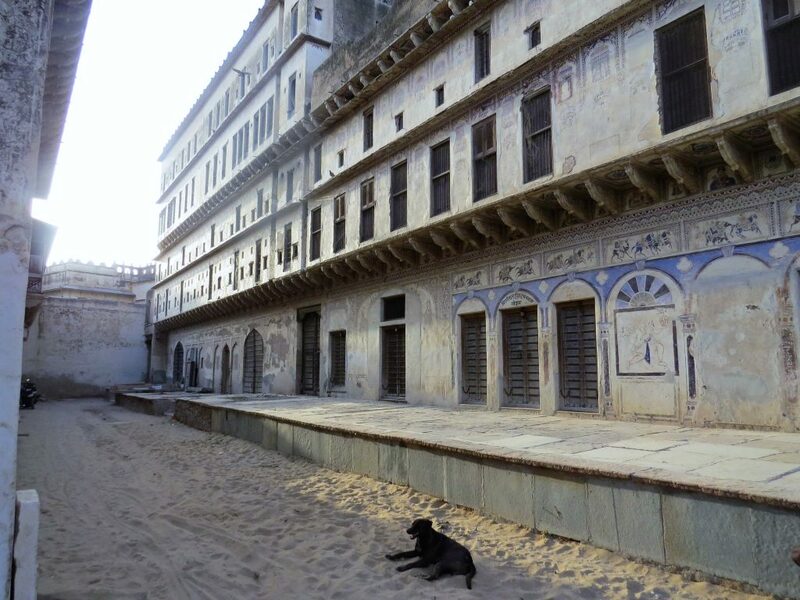 Most of the havelis have been abandoned by their owners (who migrated to Kolkata, Mumbai and Chennai), so Churu and much of the Shekhawati region has an eery, deserted-town kind of atmosphere. 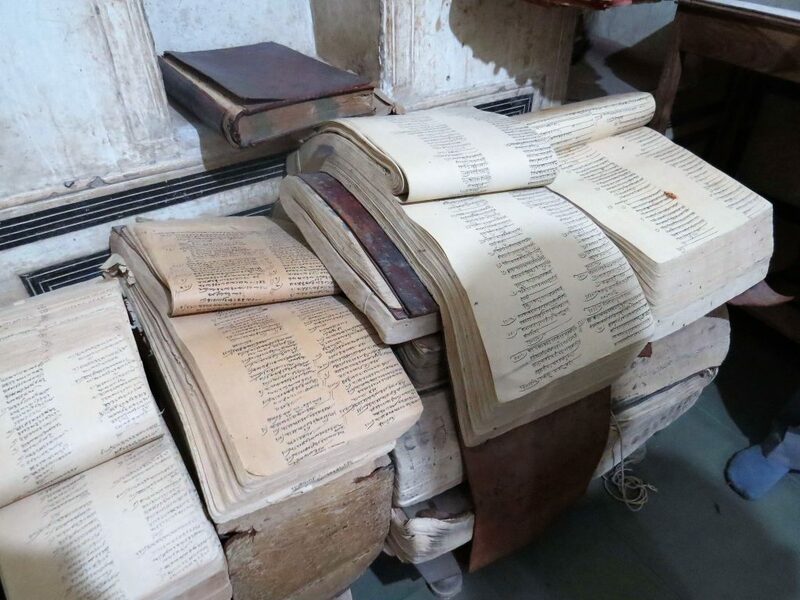 We visited the Churu Museum, which houses a number of very old texts and accounting records. These dated back to the 1700’s. The friendly museum curator explained the history behind this very old traditional skirt. 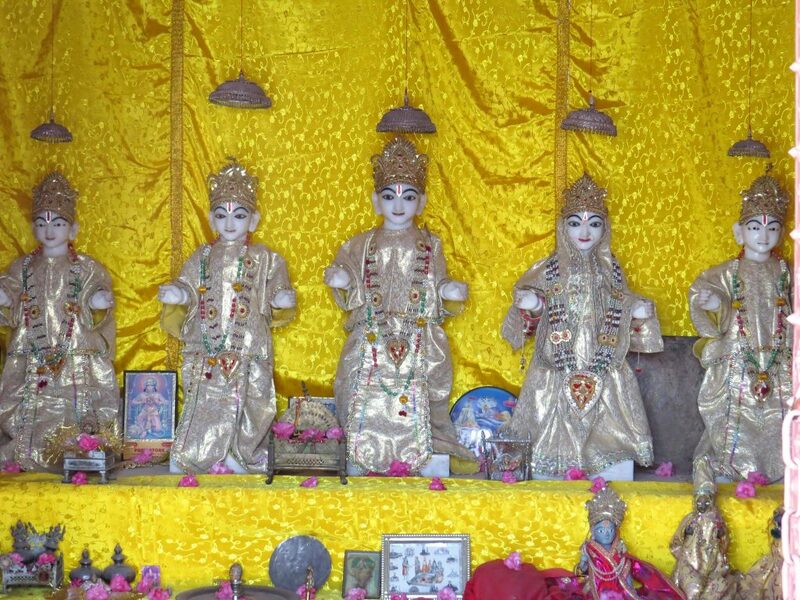 On our way back to Malji ka Kamra, our Heritage Walk ended with a visit to a beautiful Jain temple. “You came to Churu at the best time. 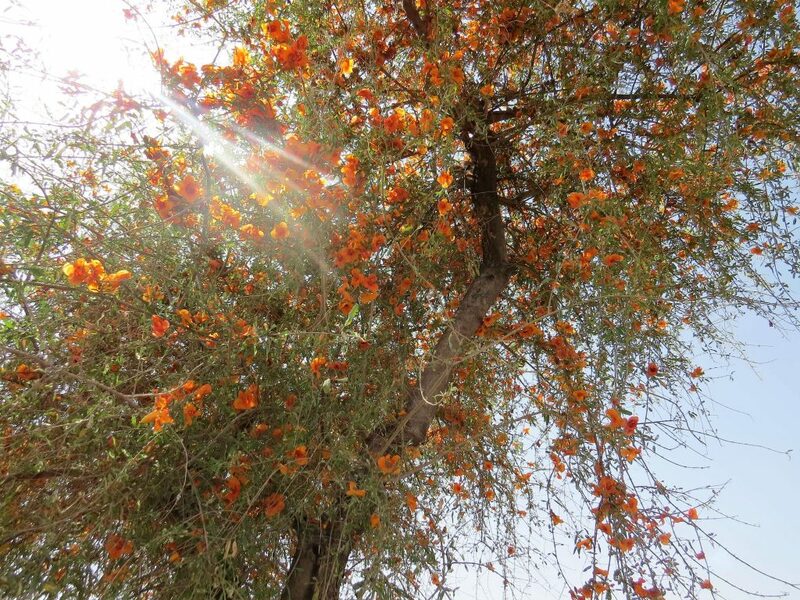 During late March and the month of April, Rajasthan’s national tree, the Roheda, is in full bloom”. 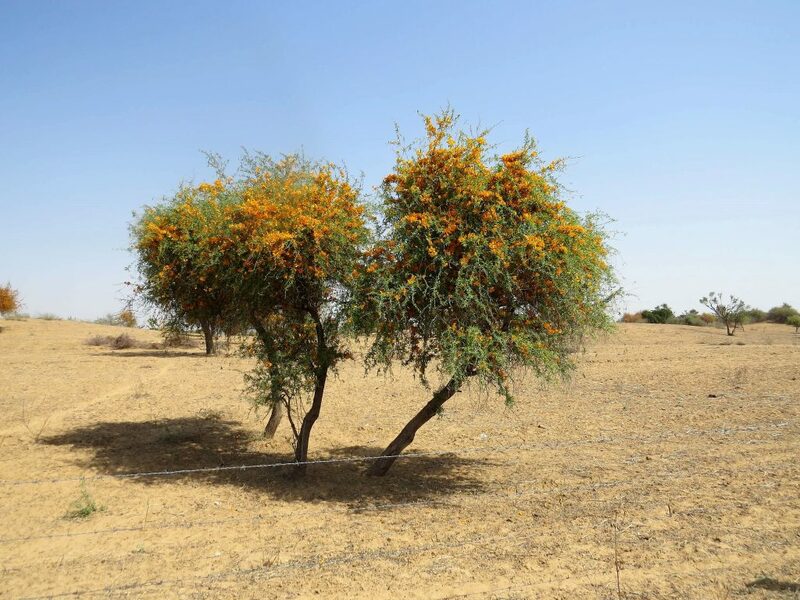 Roheda, Rajasthan’s national tree, is a pop of bright colour against the golden sands of the desert. It’s integral to life here in the desert and every part of the tree is used; the wood for fire, the leaves as fodder for cattle, and the flowers gobbled up by camels, goats and sheep. It also has a number of medicinal uses. Our desert safari kicked off with a stop at this stunning lake. It was man-made to bring water to this dry desert region. A highlight of our desert safari was the picnic breakfast laid out for us. Our table was set in an old water tank. Our guide, Mr. Lal Singh, explained that this water tank was constructed for the shepherds and their animals, so they could access cool water (for free). 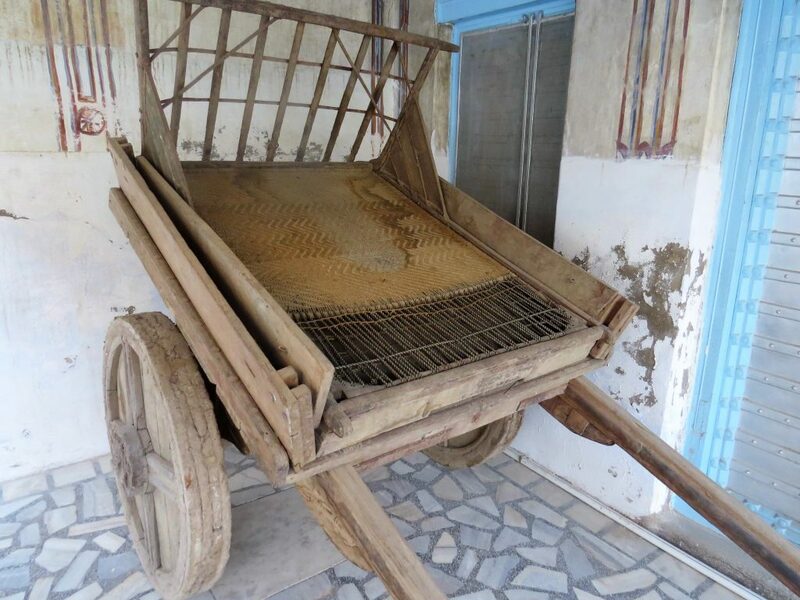 It still works today by harvesting the monsoon rains for use throughout the year. Upon returning to Malji ka Kamra, I was treated to a tour of the property by Mr. Lal Singh. 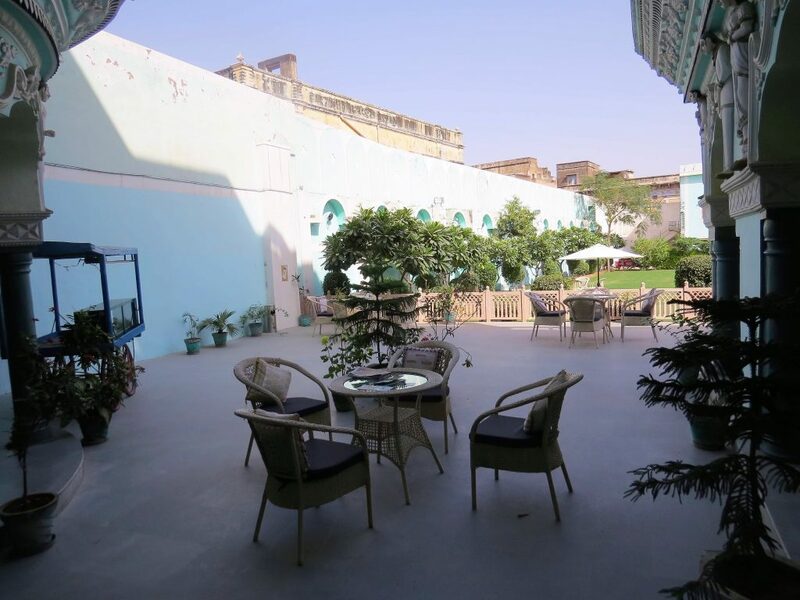 The hotel offers 12 rooms, divided into three categories: Haveli Rooms, Heritage Rooms, and the Family Suite. 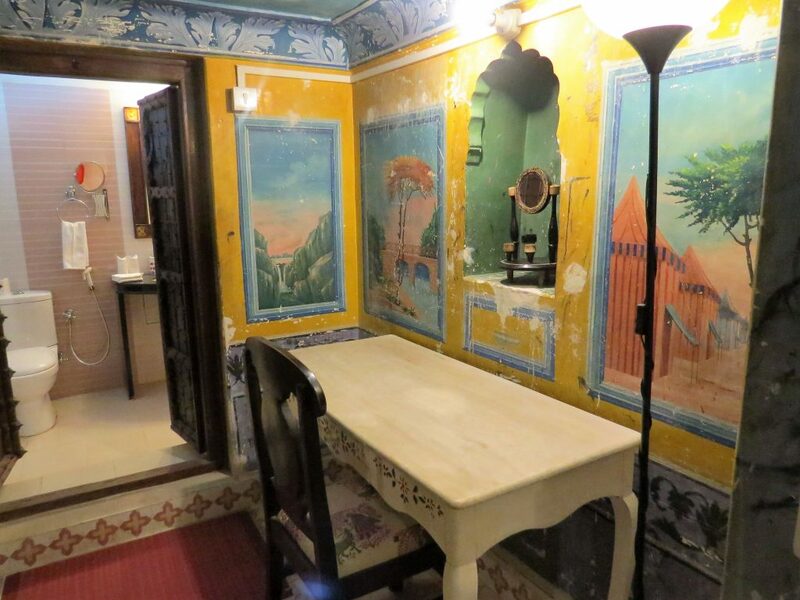 The Heritage Rooms are beautifully adorned with original fresco paintings, whilst the Haveli Rooms offer a spacious private balcony. The Family Suite, as the name suggests, is ideal for families or small groups; it comfortably sleeps four, with two double beds and a separate living area. 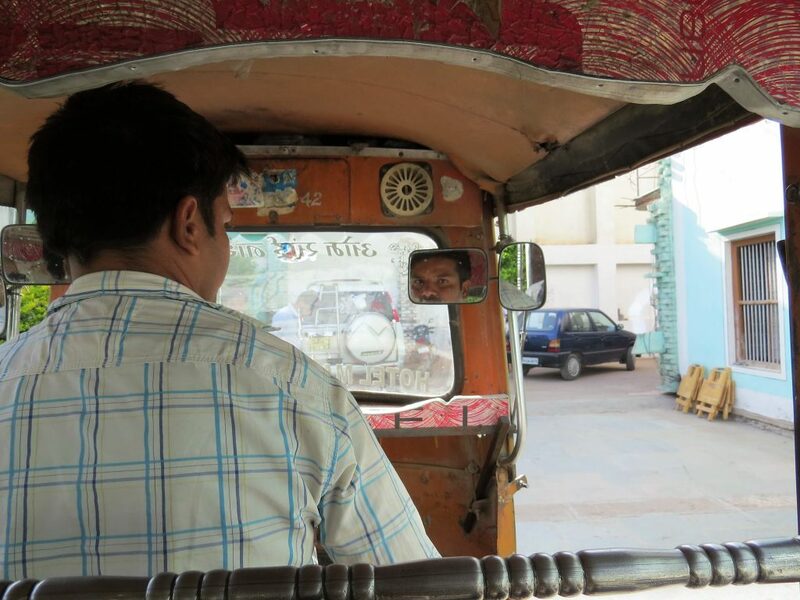 On our way out of Churu to our next destination, Bikaner, we detoured a little to the town of Mahansar. 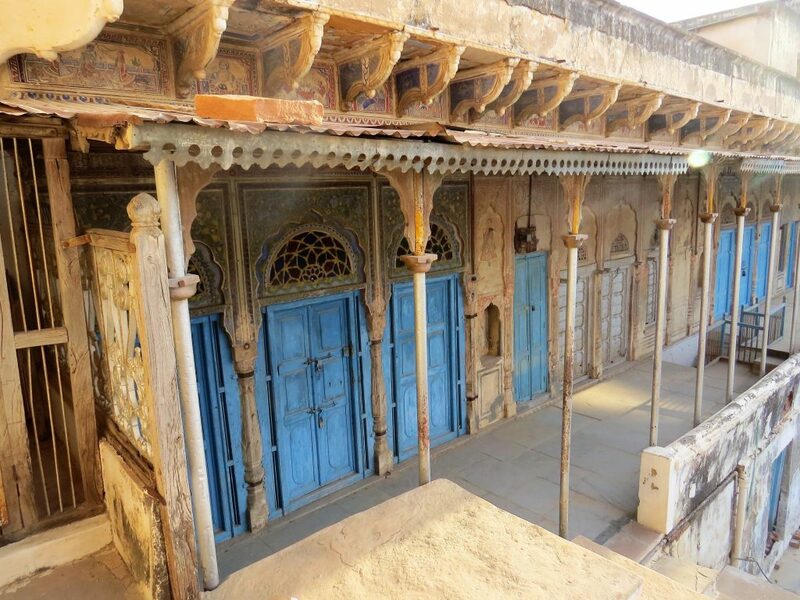 Half an hour from Churu, Mahansar is home to the impressive Sone ki Dukaan (Golden Haveli). 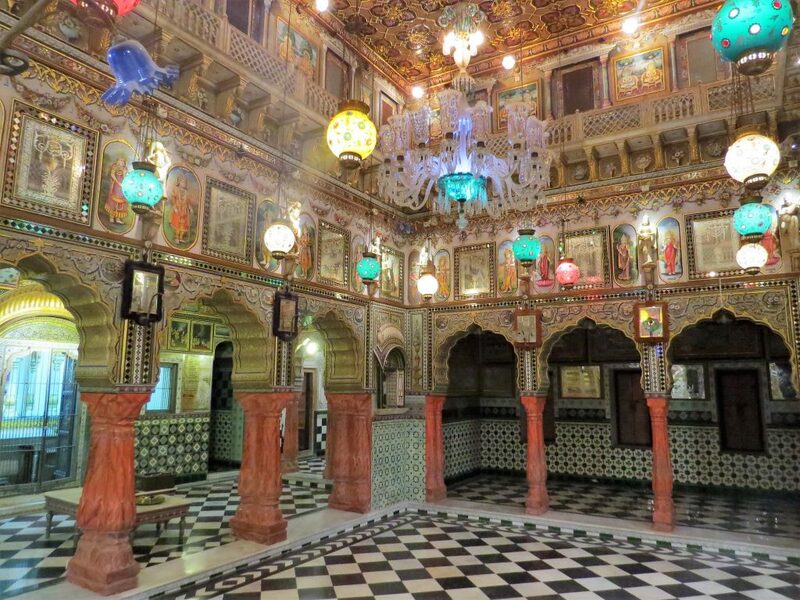 In Deepak’s opinon its one of Shekhawati’s most beautiful and well preserved havelis, and we’d have to agree! 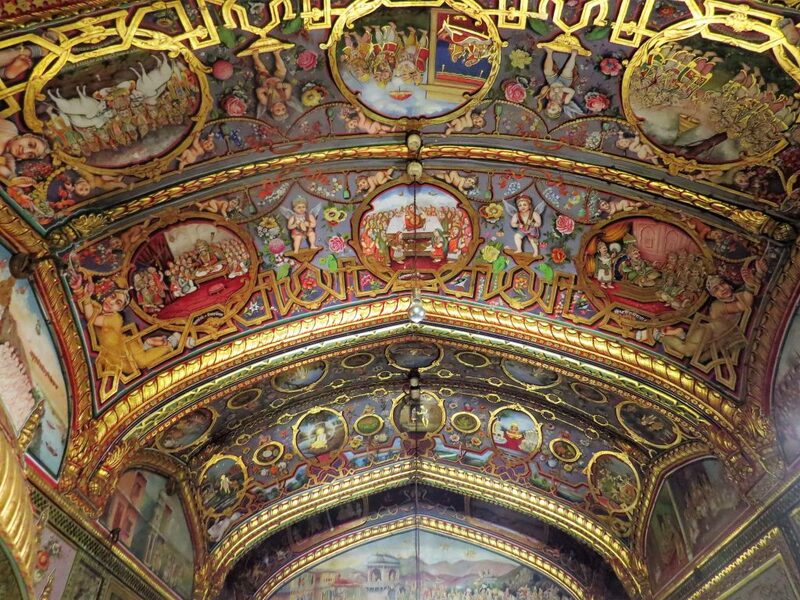 It boasts wonderfully intricate paintings and golf leaf work depicting stories from Hindu epics. Nearby the Golden Haveli is a Hindu temple dedicated to Lord Shiva, and a great view over the village. 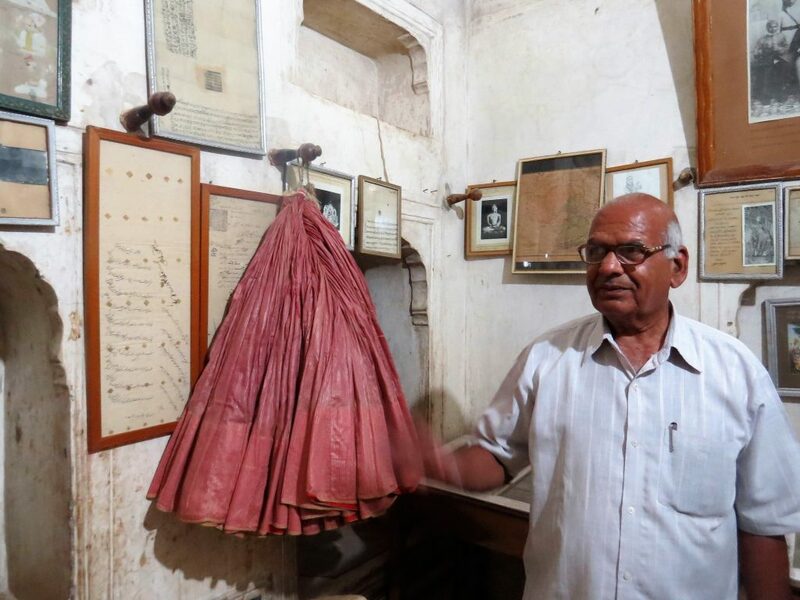 A visit to Mahansar can be included on your way out of Churu, or as a day trip during your stay – rather than driving, you may prefer to embark on a short train ride on the historic metre-gauge train, which harks back to the days of the Raj. 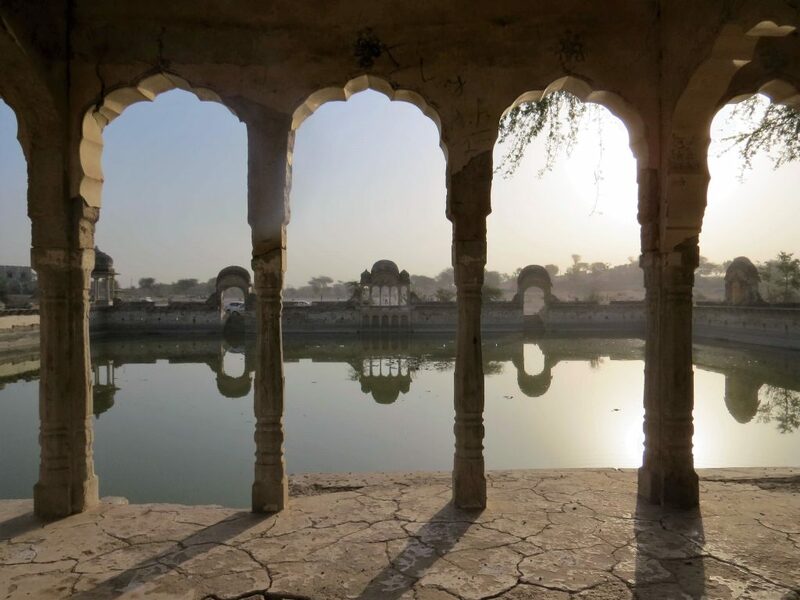 How does Malji ka Kamra, Churu, best fit within my Rajasthan tour? 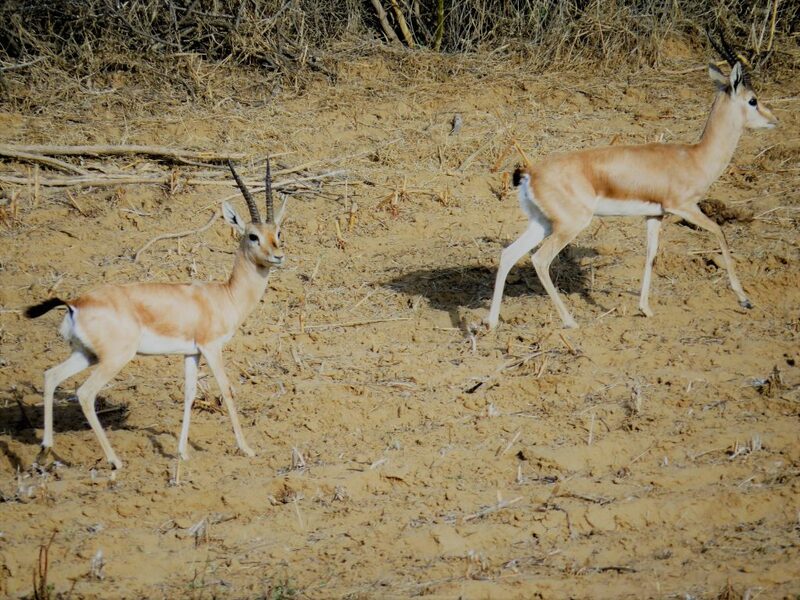 Malji ka Kamra is best slotted in between Delhi and Bikaner, as your gateway to the Thar desert. It takes about six hours to drive from Delhi. Alternately you can drive from Jaipur, or Pushkar, which take about three and five hours respectively. 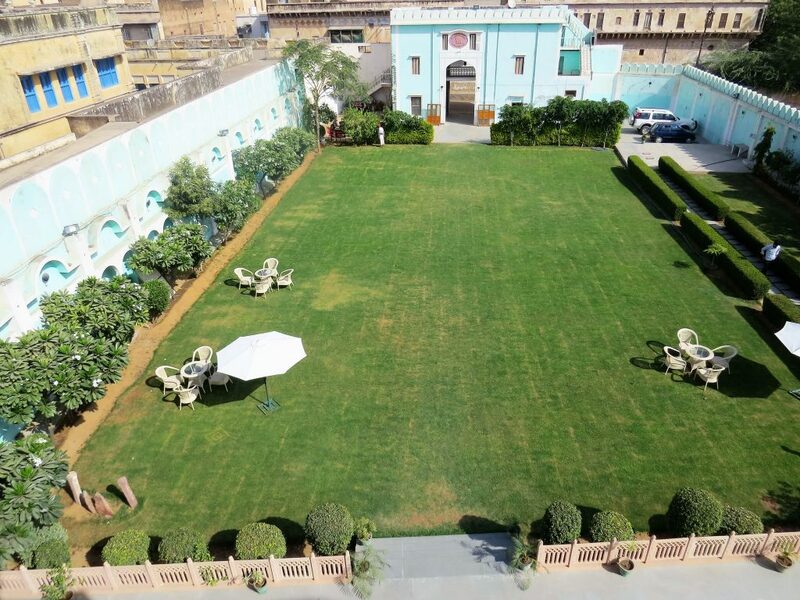 Haveli rooms at Malji ka Kamra, Churu, start from approximately $110 per double, per night, inclusive of breakfast and taxes. 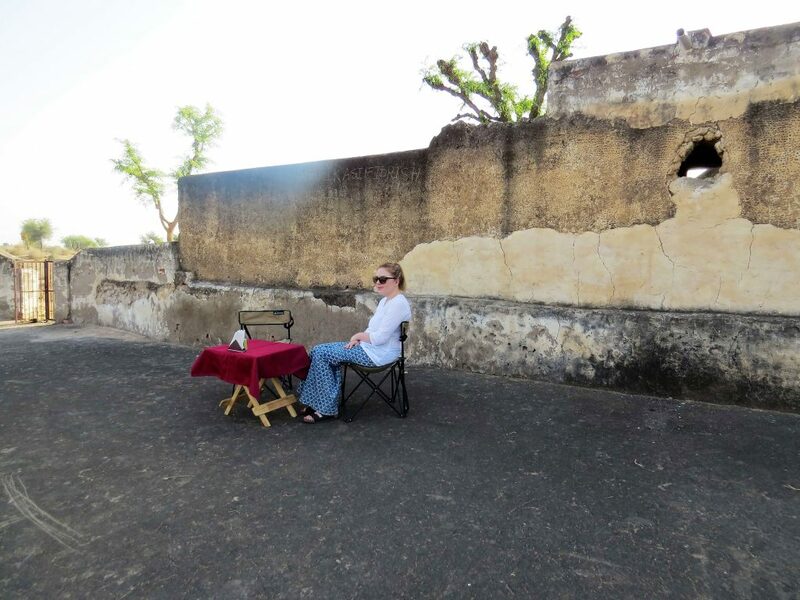 If you’d like to include a stay at Malji ka Kamra on your upcoming trip to Rajasthan, please do get in touch. As the experts in tailor-made tours of this particular region, we’d be an ideal match to assist with your arrangements. 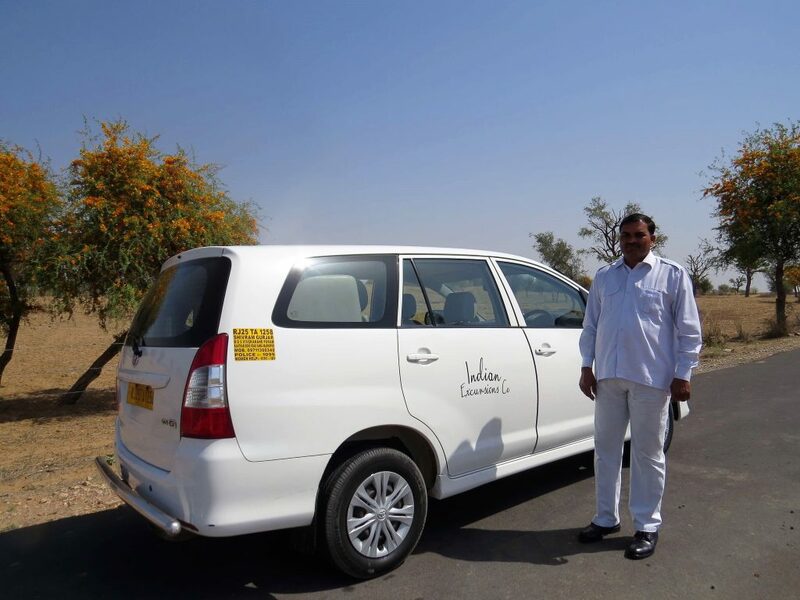 All our tours are personalised to our guest’s individual tastes, budget and requirements, though as an initial starting point you may like to consider pairing it with our Classic Rajasthan tour, or our Rajasthan with Boutique Hotels tour.